Nowadays it seems like anytime you see the words “peace” and “justice” together, they are followed by news regarding political turmoil. Let us reassure you, that is not what this is – this is a story of hope. The last couple weeks we have been unpacking our mission statement through a four-part series in which we are explaining how we are bringing our mission to life. We feel that it is important to remind you that although political figureheads and policies might change, we’re not going anywhere. The YWCA is working every day to shape the legislation that affects women.The YWCA has been involved in the Ten Actions in the First 100 Days initiative. Actions included writing postcards to senators, hosting a community huddle, and chalking downtown Muncie for the Day of Liberation. These intersectional feminist actions showed our participation in the conversation and legislation affecting equal pay, reproductive justice, and women in leadership. Not being able to attend Senator office sit-ins, staff from the organization also wrote sidewalk messages throughout downtown Muncie in regards to the Day of Liberation last month. The YWCA has been involved in the Ten Actions in the First 100 Days initiative. Actions included writing postcards to senators, hosting a community huddle, and chalking downtown Muncie for the Day of Liberation. These intersectional feminist actions showed our participation in the conversation and legislation affecting equal pay, reproductive justice, and women in leadership. Not being able to attend Senator office sit-ins, staff from the organization also wrote sidewalk messages throughout downtown Muncie in regards to the Day of Liberation last month. The YWCA works to support the women staying with us in all aspects. We can assist women with employment, health care, insurance, and even legal help. 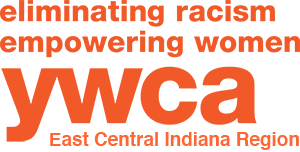 Within the past week alone, YWCA staff members have been present at court hearings, testifying on behalf of a woman in our residential program. “The resident was without an attorney and only had her mother and myself. Having a very small support system presents a whole new set of challenges. I do what I can to be there for the women any way they need,” says Kait Williams, the YWCA’s Residential Director. Although each day seems to present a new set of challenges, we feel that what we’ve done thus far is necessary for real peace and justice. We encourage you to join our mission by voicing your comments, questions, or concerns regarding our mission by engaging with on social media or by simply calling us at 765-284-3345. Be sure to check back in next week as discuss how we are promoting freedom and dignity.